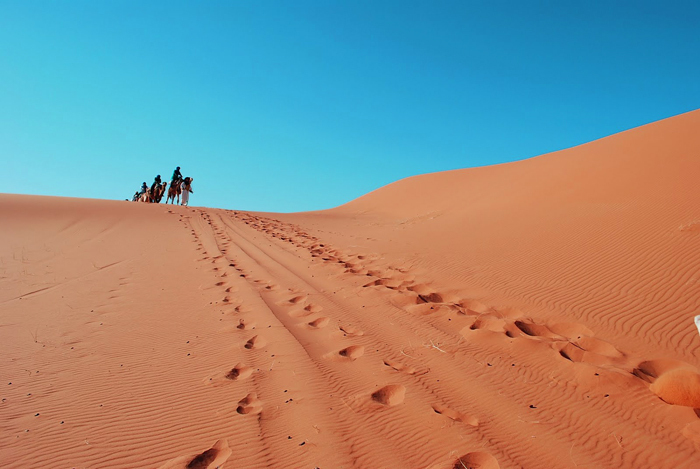 In the extreme west of the Arab world, Morocco is a land of contrast, the great outdoors, the beauty of the Atlas Mountains, Berber villages. A door opens on the happiness of a simple life and the joy of an encounter in the heart of an authentic country. DAY1. FRANCE / MARRAKECH: On arrival, reception and transfer to hotel. Desk reception and delivery of the keys in envelopes. Installation. Dinner and accommodation, hotel. MARRAKECH Day 2: Breakfast at Hotel, Visit Marrakech Koutoubia Mosque and Booksellers, built in the XII "s. by Zef third ruler of the Berber dynasty that ruled in Morocco, it was completed by his small son Yacoub AI Mansour. At a height of 77m, the origin of its name comes from Arabic meaning Kutub Manuscripts. Indeed, his feet stood the biggest souk to booksellers. El Bahia Palace: built on eight hectares during Fifteen years in the late 19th century by Ba Ahmed Ben Moussa, Grand Vizier of the King Hassan 'and King Moulay Abdelaziz, we discover the turning of a maze of corridors and stairs, the apartments of four countless women and concubines in the harem, where once were outside that blind musicians eunuchs and servants. 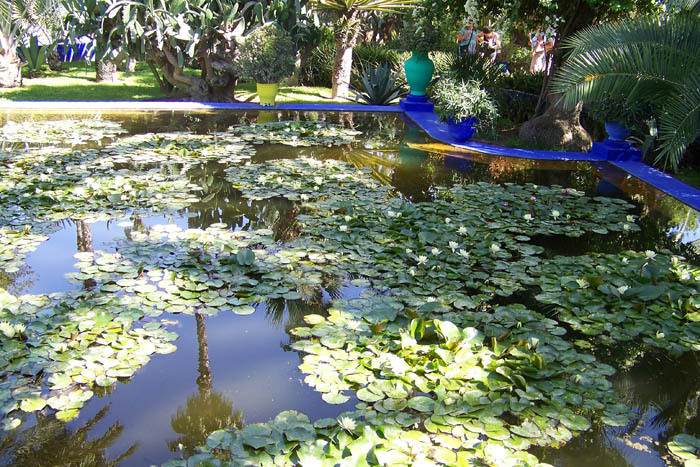 Discovery Gardens, where the Menara pavilion focus its perfect proportions in the still waters of its basin, and the Majorelle Gardens. Lunch in a restaurant in the Medina. Continuation of the Djemaa El Fna with carts full of oranges and roasted seeds. Women from the Anti-Atlas to sell their baskets, storytellers, musicians, dancers, scribes in front of their black umbrella, fortune tellers, sellers of pumpkins, healers, apothecaries offer the amazing spectacle of a day like any other. Discovery of the souks and walk through the maze of streets protected from the sun by lathing. Scents of saffron, cumin, black pepper, ginger, lemongrass, cloves, orange blossoms delight the nose. Bags of almonds, peanuts, chickpeas, baskets of dates, barrels of olives, and on the shelves of apothecaries, pots of henna, ghassoul, vials of extracts of rose, jasmine, mint, kohl, pieces of amber and musk ... The copper souk where coppersmiths hammer metal, wool souk Laghzal spent in El Batna, the skins of sheep, or the souk Zarbia, at auction, carpets and caftans sold to the highest bidder. Folklore show and dinner in a Moroccan palace in the Medina. Overnight at Hotel. Day 3. Marrakech / Ouarzazate / TINEGHIR: Breakfast, towards Ouarzazate via the neck of Tizin'Tichka through these fabulous mountain scenery, Berber villages along the route. Arrival at the Kasbah of Ait Ben Haddou and lunch. On the square in front of Ksar Heritage Unesco leaning against the side of a hill dominated by the ruined fortifications of which is a traditional pre-Saharan habitat types. The houses crowd together within its defensive walls reinforced with corner towers, visit the Kasbah of Taourirt built by the powerful tribe of Glaoui, which is a historic World Heritage Site by Unesco. 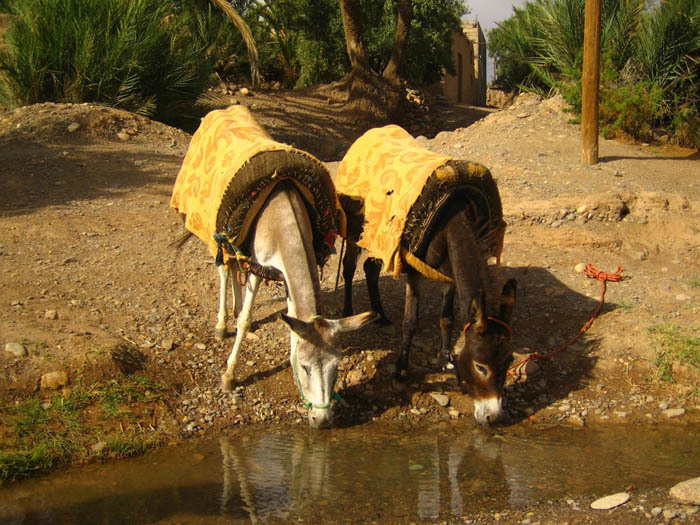 Continuation to Ouarzazate Palmeraie a nice quiet and relaxing oasis located on the road past Ouarzazate. 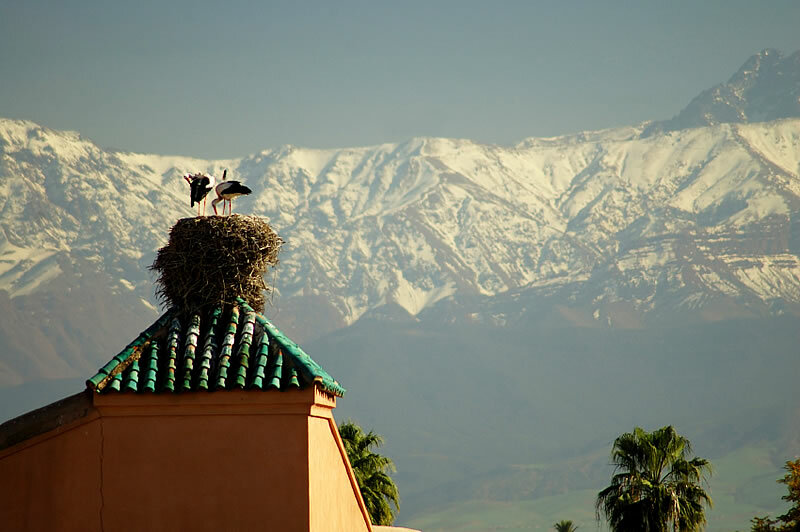 Its ancient Kasbah and huge palm trees provide beautiful views of the Atlas Mountains and along the desert landscape. 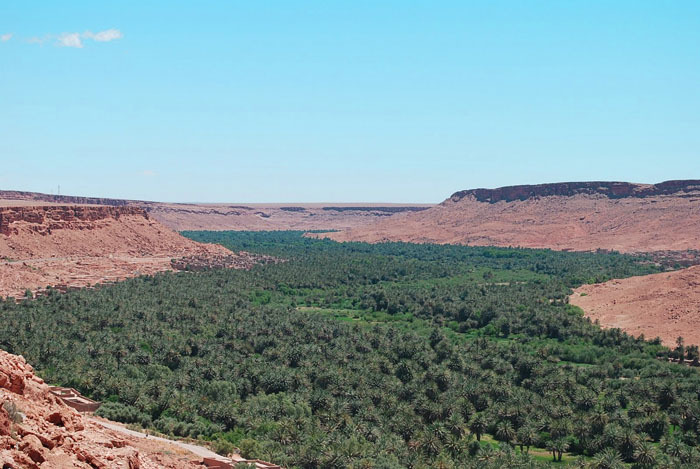 A mixture of snow and desert panoramas, then all along the Dades Valley and across the Valley of roses Kelaa Mgouna of valleys bordered by palm trees, oasis and plantations Tinghir we get to the end of the day . Overnight in Hotel. JOUR4.TINEGHIR / Erfoud / Merzouga: Breakfast, Discovery Plateau Tineghir, the terraced gardens and oasis in the Palmeraie s'engoncent to the cliffs. Impressive landscape of gorges with steep walls and narrow between which flows the river of Todra, a cheeky landscape breathtaking. Continuation to Erfoud through the town of Tinejdad, the Ksar of Touroug framed by beautiful oasis in the region. Lunch in Erfoud, departure in 4x4 vehicles to the pre-Saharan spaces, dunes, oases: the show is great, a panorama of the mythical inputs. 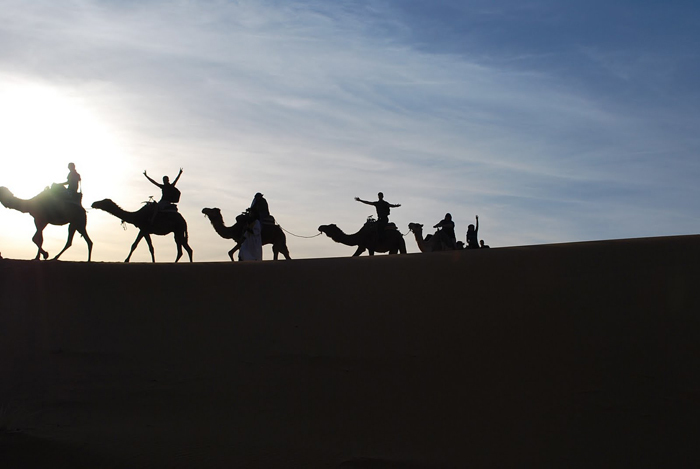 Bivouac Nomad installation dinner with Berber, unforgettable moments around the campfire, in a festive atmosphere. Night in Bivouac. Day5. ERFOUD / MIDELT / FES: Breakfast, Visit Rissani Visit Rissani old walled city and the birthplace of the Alawite dynasty then head to Fez via the palm of Tafilalet, through the Ziz Valley and Lake Hassan Addakhil . Continue to Rich by the collar of Tizin'Talrhemt to 1907 m altitude. Arrival in Midelt, lunch in a Kasbah. Arrive in Fez to the end of the day. Dinner, overnight stay. Day 6. FES Breakfast at the hotel. The visit of Fez with first-Fez El-Bali, the old city "intramural" for 9400 streets and alleys, hundreds of covered bazaars teeming with restaurants, cafes, shops of artisans, markets for meat and vegetables, fountains, mosques, madrasahs, Zouia, caravanserai. The madrasas El ¬ Attarine built in 1325 by Sultan Bou Said Merinid concentrates all the know-how of architects and craftsmen of the time with great finesse and elegance in decoration. Finally the square-Nejjarine decorated with a beautiful fountain with beautiful scenery and zelliges behind which stands the beautifully decorated facade of the caravanserai. Lunch in a Moroccan palace in the medina of Fes. Afternoon dedicated to visit of Fes-Bab El-Jadid and Boujeloud the door and the most remarkable monuments of the city, built in the thirteenth century and restored in the traditional style in 1913. It is decorated on one side of blue faience, the color of Fez, and the other of green tiles, the color of Islam. 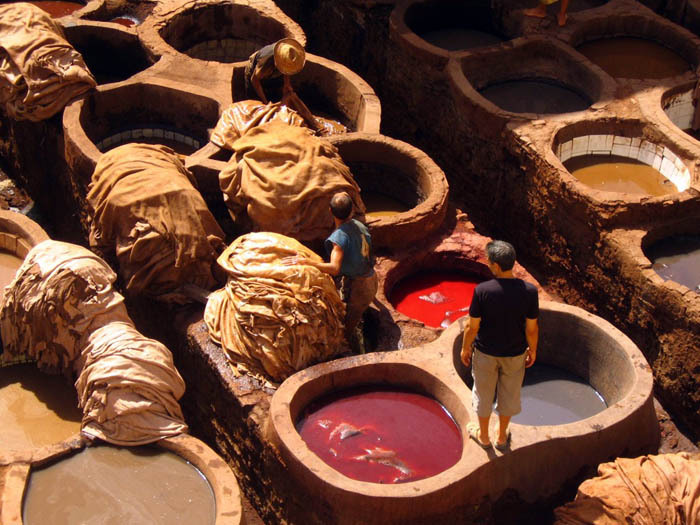 Discovery of the souks, one of the finest authentic Morocco and particularly with the tanneries not to be missed. Back at the hotel. Dinner and overnight at the hotel. Day 7. FES / MEKNES / FES: Breakfast. 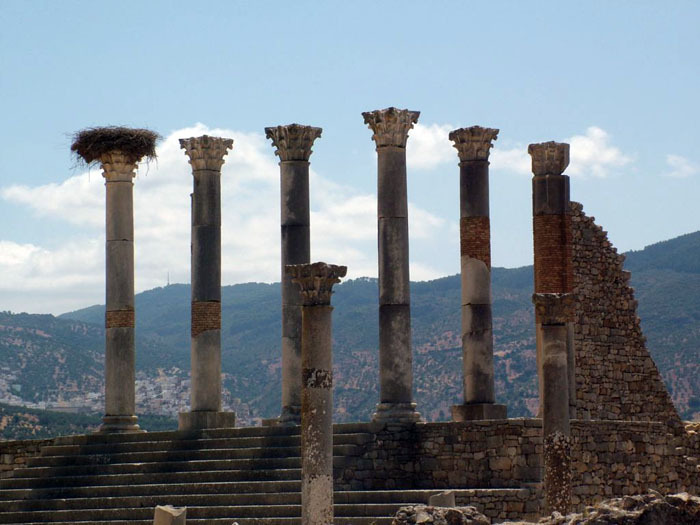 Departure to visit the Roman ruins of Volubilis. This important city of Mauritania, one of the capitals of King Juba II continued to be inhabited until the eighteenth century The ancient city was updated at the end of the nineteenth century by French archaeologists. His particular interest lies in its many remarkably preserved mosaics and scattered across the site. 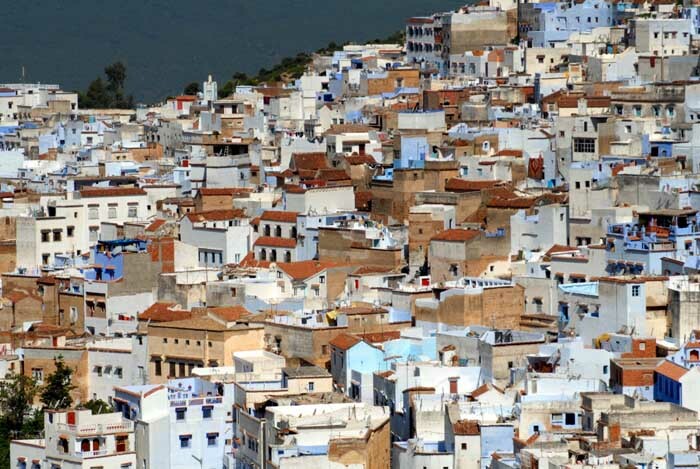 Visit the holy city of Moulay Idriss, which houses the tomb of the first king who ruled Morocco. Continuation to Meknes. Lunch at a Palace and a visit to the city: its monumental gate, Bab El Mansour, Beb El Khemissa, guardian of the imperial city and most famous of Morocco is lavishly decorated with zelliges, ceramics and green stucco well preserved. Place el-Hedim in the heart of the old town between the city Merinid of the imperial city dating from the seventeenth century Vaulted attics Heri el Souani which were stored reserves of grain and hay for horses to 12,000 of Moulay Ismail. A constant temperature and fresh was obtained through walls seven feet thick and pipes, which are themselves fed by deep wells. Back to Fes. Dinner, overnight stay. Day8. FES / CHEFCHAOUEN: Breakfast, Departure to Chefchaouen through Ouezzane between the rugged hills of the pre-Rif and the agricultural plain of the Gharb. 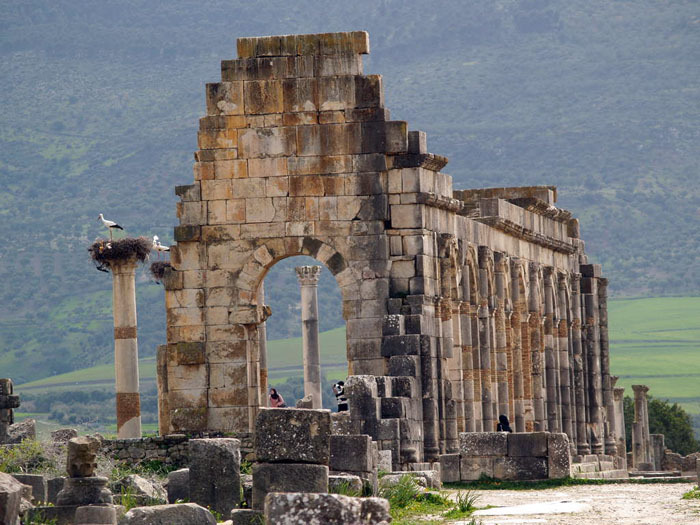 The city of Ouezzane, holy city and pilgrimage site, is known for its olive groves and production of quality olive oils. Lunch. 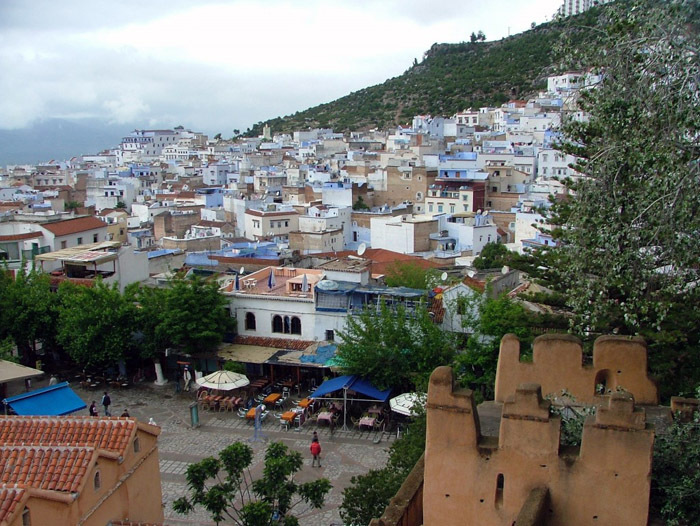 Arrival in Chefchaouen, a typical tour of this city, more commonly known Chaouen. 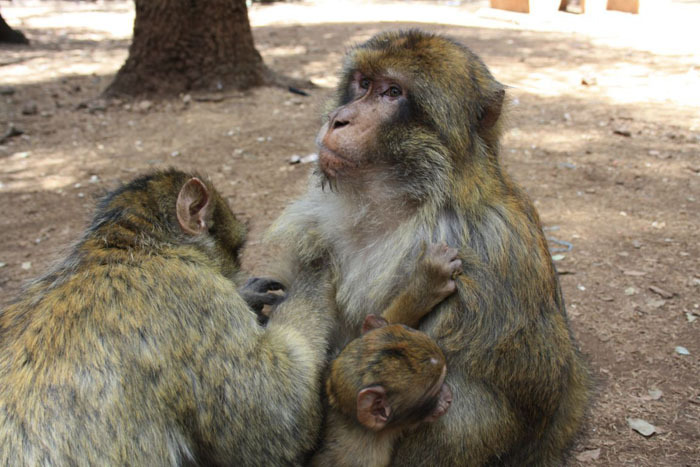 It is nestled between two mountains that form the Jebel Ech-Chaouen "the mountain of the horns." This is the Place Uta el-Hammam that stand the remains of fortifications built in the fifteenth century to me by the founder of the city. The Djemaa el Kebir mosque was also built at the same time and takes the Andalusian style. Dinner, overnight stay. Day9. CHEFCHAOUEN / Tetouan / Tangier ASSILA: Breakfast. Crossing the hills of the Rif up to Tetouan and its medina, built in 1492 influenced by the architecture of Andalusia on the list of World Heritage of UNESCO. Continue to Tangier. Lunch in route. Orientation tour of the city and its medina mythical city with the visit of Grand Socco, instead of the Kasbah overlooking the bay and Cape Spartel meeting of the Atlantic and Mediterranean. Dinner, overnight stay. Day 10. TANGER or ASSILA / RABAT / CASABLANCA: Breakfast at the Hotel. Departure to Rabat, visit the administrative and political capital of the kingdom founded in the third century Sherifian av. BC along the river Bouregreg. City tour with the Esplanade de la Tour Hassan, a gigantic red unfinished minaret 44 m, the prestigious Mohammed V Mausoleum, the father of Hassan II, decorated with marble, gold leaf and onyx, the royal palace and Oudayas Kasbah, fortified area that overlooks the estuary and the Atlantic Ocean. Lunch at the road to Casablanca and then on an orientation tour of the city: the place of the United Nations decorated in the center of a luminous fountain whose water jets accompanied by moments of Arab music, European and Asian lead to a fascinating spectacle. Place Mohammed V is characterized by a large transparent hemispherical dome that allows light of day walkways underground, separates the ultra-modern city of the old medina. The residential area of ? ?Anfa with its beautiful villas hidden in the vegetation and panoramic hotel that housed the conference of heads of allied states in 1943. The road to the ledge to the west of the port: on the beach and along the avenue that borders it, there are many establishments and restaurants. The Hassan II mosque (exterior), royal commission concluded in 1993 to 172 m Its minaret is the tallest religious monument in the world. It covers 20,000 m2 area and this place just after the Grand Mosque in Mecca. For Morocco, this mosque can accommodate 20,000 worshipers next to each other, should be the symbol of an enlightened Islam. A laser beam at the top of the minaret indicates the direction of Mecca. Start the coastal road offers beautiful views of the sea and lagoons. Stop in El Jadida "The Moroccan Deauville" with its famous beach. Visit the Portuguese cistern. Continuation of the coastal road offers beautiful views of the sea and lagoons, fish lunch specialty in Oualidia, a charming little resort on the lakes and fishing port. Then on to Safi Safi Orientation tour, long a Portuguese city. Of that time remain the Sea Castle, fortress of the XVI century, a chapel, the remains of a cathedral and Kechia, which encloses within its walls fortified seat of a white palace Makhzen. Safi is also known for its ceramics, and departure to Essaouira. Dinner and overnight at the hotel. Day 12. Essaouira / Agadir: Breakfast, Morning dedicated to the old Mogador with its narrow streets are straight and rectilinear trace square, white alleys breathe iodine and sea breeze, its medieval architecture of the medina is a world visit the port, fish market, the artisans working wood including cedar. Lunch of fish. JOUR.13 AGADIR / TAROUDANT / MARRAKECH: Breakfast, departure to the ancient capital of the Souss Taroudant with its crenellated ramparts, crafts and Berber silver jewelry palm trees and lush gardens. Taroudant authentic at the foot of the High Atlas mountains. Lunch in route and departure through the fertile valley lined with argan trees, orange trees, fig trees, pomegranates and other through the Tizi n'Test point of view extraordinary wild and arid then the circus dominated by Tamarout Jebel Toubkal, whose highest peak in North Africa, rises to 4167m. Splendor of nature! Photo stop of the mosque of Tinmel, this old Berber village of the eleventh century located in the Moroccan High Atlas to 100 km south of Marrakech. 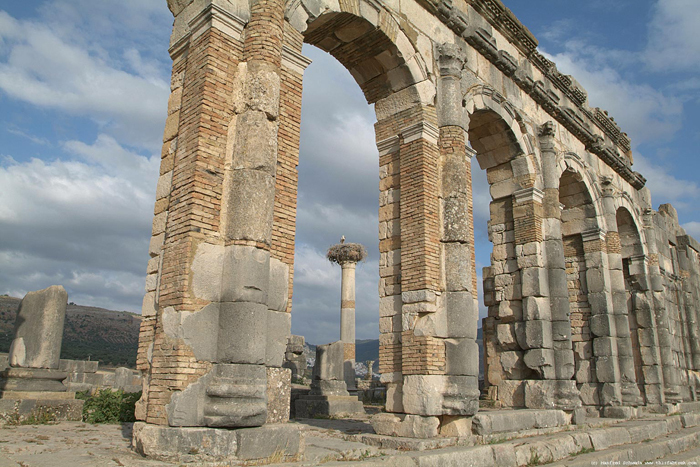 The Almohad conqueror departed from this city to conduct their military campaigns against the Almoravid dynasty, one afternoon before exceptional addressed Ouirgane drowned in the greenery of almost alpine scenery and Asni. Arrival in Marrakech in the evening. Overnight in Hotel. JOUR.14 MARRAKECH: Breakfast, Lunch and Day. Dinner and overnight at the hotel. Day.15: MARRAKECH / France: Breakfast at the hotel. Transfer to the airport, assistance with the registration formalities and then off to France. Transfer to the airport, assistance with the registration formalities and then off to France. - Transfers airport / hotel / airport and transport by minibus. - Full board from dinner on day 1 to breakfast day 15 except day 14 in DP. - Folklore evening with a Moroccan palace in Marrakech Day 2. - Services of a French-speaking national guide throughout the tour.